Caterpillar is leading the DJIA higher as the European Central Bank announces stimulus measures. Caterpillar (NYSE:CAT) is leading the Dow Jones Industrial Average (DJINDICES:^DJI) up after the European Central Bank announced new stimulus measures to boost growth in Europe. As of 1:30 p.m. EDT the Dow was up 92 points to 16,830. The S&P 500 (SNPINDEX:^GSPC) was up 12 points to 1,940. The big news today is the European Central Bank's stimulus plan. The European Central Bank cut its lending rate from 0.25% to 0.15% and cut its deposit rate from 0% to -0.1%. This means it now costs banks to deposit money with the central bank, giving banks an incentive to loan this money out or put it elsewhere. This is first time ever that a major central bank has adopted negative interest rates. Sweden and Denmark, relatively small countries, have done so before in an effort to keep out fast money, but this is uncharted territory for a major central bank. The European Central Bank hopes these measures will spur lending in Europe. Europe, like most developed nations, is highly leveraged and facing structural issues in its economy. Europe is trying to lower its debt burden through growth and inflation, but inflation has been steadily trending lower. 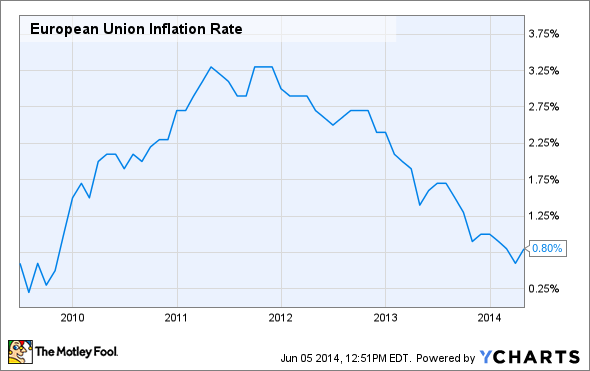 European Union Inflation Rate data by YCharts. The above chart is only updated to April. In May euro zone inflation weakened to 0.5%, well below the European Central Bank's target of 2%. The European Central Bank fears that the economy will actually experience deflation, which can lead to a cycle in which consumers, expecting prices to fall, hold off on purchases, slowing economic growth and in turn causing prices to fall more. This is what Japan has been experiencing for almost two decades now, with disastrous results for investors in the country. As such, the European Central bank introduced today's measures to spur growth around the eurozone. With Dow Jones companies deriving a significant portion of their revenue from Europe, it is no surprise the Dow is higher today. Caterpillar is leading the Dow Jones today, up 2.3% as investors expect the European stimulus will help spur on growth in Europe. Caterpillar sells heavy machinery to the most economically sensitive parts of the world economy: the mining, energy, and construction sectors. While some investors believe Caterpillar could hit $120 per share on the strength of its U.S. energy and transportation segment, I still believe Caterpillar investors are overlooking ominous signs for the company -- namely, the continued slowing of the Chinese economy, which is driving the world's commodity sector, and the fact that new growth is coming mainly from the construction sector, which is Caterpillar's lowest-margin segment.